* You may click on any of the four thumbnails below to see the actual text. * Excerpts from each thumbnail appear immediately below that thumbnail. Emphasis added by editor. * Editorial comments by COPWATCH.COM appear in red. * See the previous page for the full story. 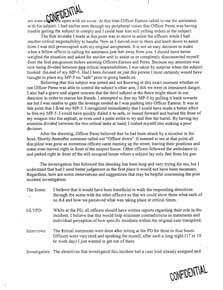 A three-page memo written by Officer David Acosta, who was found to have committed the unjustified shooting. "NLVPD: While at the PD, all officers should have written reports regarding their role in the incident. I believe that this would help eliminate contradictions in statements and individual perception of how specific incidents within the original case transpired." How can King County possibly claim to have conducted a adequate investigation of the shooting-- one year after the fact-- when the shooter himself acknowledges that the primary witnesses to the incident were not required to file written reports? When finally interviewed by the two representatives from King County, (if indeed any interviews were conducted at all) the witnesses relied on fading memories to reconstruct the events of that tragic evening. After a year spent discussing, debating, refining, and aligning their stories, is it any wonder that their final version of the "truth" was considered benign by King County? "Shoot board: This is not an easy assignment for anyone, but I felt that Officer Meamber should not have been on the board. We work closely together on a squad that is very "tight" and I felt it was unfair for us to face each other in the shoot board. Also he was on the scene as a participant of the incident being investigated." 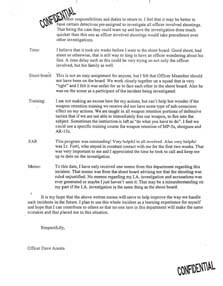 "Memo: To this date, I have only received one memo from this department regarding this incident. That memo was from the shoot board advising me that the shooting was ruled unjustified. No memos regarding my I.A. investigation and accusations was ever generated or maybe I just haven't seen it." This is the smoking gun… the only available proof that the shooting was deemed unjustified. North Las Vegas successfully repressed all information except for this single document, which was anonymously leaked to an intrepid Copwatch.com member. But this document raises many more questions than it answers- for example, there has been no other mention of either the mysterious "I.A. investigation" or the unspecified "accusations". North Las Vegas MUST be forced to reveal this crucial information, as well as all the facts regarding the unjustified shooting. What was the focus of the Internal Affairs investigation? What were the specific accusations, and who made them? Were the accusations accurate? We demand to know the answers to these questions. Public safety is at stake. 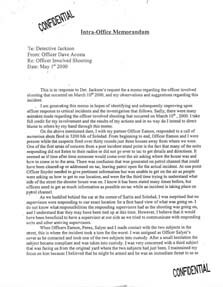 A one-page memo written by Officer Duane Eamon regarding the unjustified shooting . 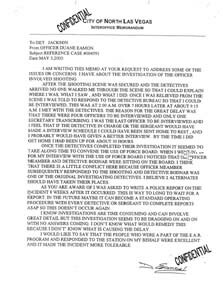 "I AM WRITING THIS MEMO AT YOUR REQUEST TO ADDRESS SOME OF THE ISSUES OR CONCERNS I HAVE ABOUT THE INVESTIGATION OF THE OFFICER INVOLVED SHOOTING." "WHEN I WENT IN FOR MY INTERVIEW WITH THE USE OF FORCE BOARD I NOTICED THAT OFFICER MEAMBER AND DETECTIVE BODNAR WERE SITTING ON THE BOARD. I THINK THAT THERE IS A LITTLE CONFLICT HERE BECAUSE OFFICER MEAMBER SUBSEQUENTLY RESPONDED TO THE SHOOTING AND DETECTIVE BODNAR WAS ONE OF THE ORIGINAL INVESTIGATING DETECTIVES. I BELIEVE 2 ALTERNATIVES SHOULD HAVE TAKEN THEIR PLACES." "AS YOU ARE AWARE OF I WAS ASKED TO WRITE A POLICE REPORT ON THE INCIDENT 8 WEEKS AFTER IT OCCURRED. THIS IS WAY TO LONG TO WAIT FOR A REPORT." As this memo again confirms, it was absolutely impossible for King County to conduct an adequate investigation of the shooting. This officer was not asked to write a police report until 8 weeks after the incident, a time-span he himself acknowledges was "way too long". If 8 weeks was way too long, then a year is WAY, WAY, WAY too long!